Google provides a cloud-native operating system and productivity suite that helps its customers improve security, increase productivity, and strengthen employee experience (EX). 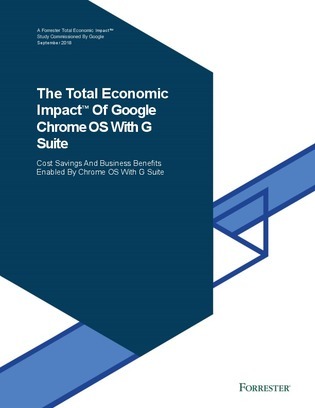 Google commissioned Forrester Consulting to conduct a Total Economic Impact™ (TEI) study and examine the potential return on investment (ROI) enterprises may realize by deploying Chrome OS with G Suite. Download this study for a framework to evaluate the potential financial impact of Chrome OS with G Suite on your organization.